One year ago today, a group of Marines, U.S. soldiers and Afghan security forces were pinned down in a kill zone near Ganjgal, Afghanistan, a remote village in the unforgiving, mountainous terrain of Kunar province. At this point, the basic details of what occurred that day are well known. Repeatedly denied air support and artillery by officers at a nearby forward operating base, they were left to fend for themselves against more than 100 well-entrenched insurgent fighters. Three Marines and a Navy corpsman were killed on the battlefield, and a U.S. soldier died Oct. 7, 2009, from medical complications that stemmed from him sustaining a neck wound in the battle. An already-wounded Marine corporal, Dakota Meyer, charged into the kill zone to retrieve the bodies of his four buddies, causing some to speculate he deserves consideration for the Medal of Honor. This blog post isn’t about what happened or who could have prevented it, though. No, this post is about those lost, and the proud, grieving families they left behind. Over the last year, I’ve grown a friendship with and immense respect for several of those families as I’ve covered what occurred for Marine Corps Times. They’ve done everything they can to find positives in their losses. Many of them plan to meet this weekend in Williamsville, N.Y., to mourn together in person for the first time, and I’m honored to say they’ve asked me to attend. At their request, I’m doing so. If they want me there, it’s the least I can do. Being the Mother of Fallen Hero Aaron Michael Kenefick, USMC, KIA September 8th, 2009….I am here to say that I pray each day for the other families of the fallen this day and always…Life is different, forever in time….My family and I take life one day at a time, one minute at a time….Life is soothed by the love and support of these other family members such as Charlene Westbrook, Brent Layton and Brian Johnson families as we help to heal one another on a daily or weekly basis….This tragedy did NOT have to be so compounded to the degree that it was. Logistics was not running properly, Communications was not up to par the way they should have been. Although I am not God, I can say as a Mother of a Marine, A daughter of a Marine, and former Army Vet myself, that the former rules of engagement, combined with the dysfunction of the officers in charge of communications that were not at their posts for what ever reason, were the basis for such compounded loss of life….One of them my Son. Although we know during war this is the sacrifice we make and the risks we take, it is appauling that the former rules of engagement kept our airforce’s hands tied behind their backs so that they could not go in to administer help with added airfare and artillery. 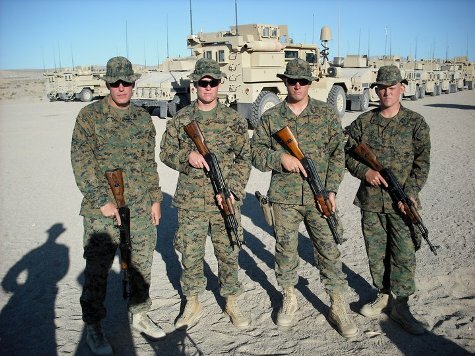 I know my Son Gunnery Sgt Aaron M Kenefick, USMC and the other fallen heroes this day and during this entire era fought for their lives and for ours….These men gave up their today for our tomorrow. They no longer have a voice in this world, so as a Warrior Mother, I will be sure that the voices of my family, myself and others, will be heard to the full account. God Willing!!!!! God Bless our Fallen Heroe’s all around the world and their families. I pray for the gift of Peace in their day and throughtout the rest of their lives. Gold Star Families are apart of an organization that no one wants to join, but to be apart of liked minded people with passion for their loved ones helps to heal the pain…..
Lord Thank You for allowing me the title of Mother for such a Hero and Humanitarian….Gunnery Sgt Aaron M Kenefick, USMC!!!!!!! OOH RAH!!! I am the sister of Fallen Hero Gunnery Sgt Aaron Michael Kenefick, USMC, KIA September 9th, 2009. This week marks the one year anniversary of the loss of my beloved brother, and yet, we celebrate his life with all the sacrafices he made for us, his family, and country. I just want people to know that my brother Aaron, loved from the depths of his soul, his family & friends, God and His Country, and was passionate about being a US Marine, and seeing the world. I am grateful that Aaron got to meet and love my baby daughter Ava, and the few pictures I have of him holding her, I have framed and adorning the table in my living room for everyone to see….At times Ava looks at the pictures and waves to her Uncle Aaron as if he is near. I want people to know that due to the rules of engagement and poor politics on the battlefield, the loss of my brother has crippled our family, as his legacy can only be carried on by the memories we share and speek of Aaron…..God Bless all of our Familes of the Fallen!!! RIP Aaron, you are loved and missed so much!!! I am Navy Corpsman James Ray “Doc” Layton’s Aunt. The news of this loss was life changing for the whole family. As the hours turned to days, then to weeks and the weeks to months, so much as been brought to light about the horrific turn of events that fateful day. It should have never happened. These men were not fought for and supported during their mission (at the hands of top officials) as one would count on while he or she is fighting for their country. But as we now know this group of men are true warriors and hero’s. They were devout to their commitment to their mission and to one another. There are no words than can express the greatness of each of these men. They had done so much more for their fellow troops and aspired to a level of honor that is unimaginable to most. Each of these men is greatly missed by their families. As each family moves forward with life there will always be these special men missed, forever. And how we must never forget the bravery of Dakota Meyer, a true brother to our hero’s, he brought them home!! I recall during this time last year when someone commented to something I stated about government/military procedure (facts). The response I got was “oh, I doubt that the government/military would do something like that”. Now, flash forward six months to the 500 page report with an accounting of lack of protocol and procedure that led the military to take responsibility for the failures that day. I have attended a few of the many events that honor my nephew, and others. People need to realize that these men are a few of many. They give all, for all for us. Freedom is not free! These lives that are lost in war are from individuals whom volunteered to serve our country. To me this speaks volumes about the men and women who serve in our military. I am greatful to all of them, with all my heart and soul. God bless all the families of the fallen and especially those families that have shared this tradgedy with our family. Thank you all for the support and friendships you have extended to my brother Brent (James Father) and the family. You are blessings that have come out of a tradgedy. We honor and remember all the fallen, I hope everyone who reads this remembers, because of our troops and their commitments we are privledged to be able to be on a computer and read these articles and post what we have to say, this is just a small part of our freedom! We Miss you James, forever! Do you have some information you want to give to a trusted source? Former Marine? There are many benefits from hiring concrete contractors that many don’t realize, and this is simply because most people believe that hiring any professional contractors will simply be a very expensive and complicated ordeal. While it’s true there are some companies that do charge a lot of money for what seems like little return, there are others that pride themselves for providing the best work and service to every customer they get.